I give historical/ecological tours at the Collier Lodge site at Baum’s Bridge. Most of the tours are for Valparaiso University students. I begin the tour at the Collier Lodge with the historical background of the area and then walk through the bayou to the Kankakee River for the ecology part. During the history portion when I share the rich and famous that visited the Baum’s Bridge area I ask who knows who Lew Wallace was. Most often the answer is a “high school in Gary.” I believe that Lew Wallace is the most underappreciated and largely forgotten notable Hoosier. Wallace was born in 1827. His father, David Wallace, was the 6th governor of Indiana. Wallace served as a 2nd Lieutenant during the Mexican War and was a Major General during the Civil War. Because of his legal background he was appointed as a judge on the Abraham Lincoln assassination trial and was the presiding judge of the Captain Wirz Andersonville prison trial. In 1878 Wallace served as Governor of the New Mexico Territory, squelching the Lincoln County Wars. In 1881 he was appointed Minister to Turkey. While minister he developed a close friendship with the Sultan, Abdul Hamid II who was the ruler of the Ottoman Empire. When Wallace resigned as minister, because of the election of Grover Cleveland in 1884, he was offered a position by the Sultan which he declined. Wallace is best known as author of Ben-Hur. It was after President James Garfield read Ben-Hur and recognizing his knowledge of the Mid-East that he appointed Wallace minister. At this point you’re probably wondering what the heck Wallace has to do with the Kankakee River. He loved the Kankakee River! Even though he was raised on the Wabash, he loved the wonder and mystery of the Kankakee. Old Timers agree that Wallace first came to the Kankakee River with a group of young hunters from Indianapolis in 1858. He owned a power launch and houseboat he named “The Thing” and steamed the Kankakee, mostly headquartering out of Baum’s Bridge. He was also frequently seen at English Lake in Starke County. Jim Collier stated that Wallace docked a “hundred yards south” of the Collier Lodge. We have reports that he dined regularly at the Collier Lodge. 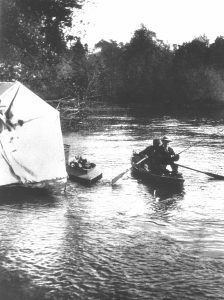 Unless required by other duties Wallace was on the Kankakee River at least three times a year for the waterfowl migration season and pickerel fishing until 1894. By 1893 Wallace was experiencing some health problems with a growth in his nose. Lecturing and public speaking became more difficult for him. In 1904 Lew Wallace made his last visit to the Kankakee River at Baum’s Bridge and passed away on February 14, 1905. His son Henry continued to visit the Kankakee River at Baum’s Bridge until his death in 1926. Wallace’s houseboat was disassembled and the material was used to build a cabin at Baum’s Bridge which remains standing to this day. Lew Wallace was not only a great state, national and international figure, he was also one of the larger than life figures of the Kankakee River, particularly the Baum’s Bridge area in southern Porter County. Jim Collier told how his family was visited by Wallace: “General Lew Wallace worked in his houseboat on the novel Ben Hur. 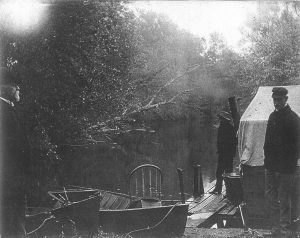 Wallace was a regular visitor in the Collier home.” His houseboat was moored a 100 yards south of the Collier Lodge at Baum’s Bridge. Lewis “Lew” Wallace was born on April 10, 1827 to David and Ester French Wallace in Brookville, Indiana. The Wallace family was very important in early Indiana society and politics—Lew was no exception. In 1832 the Wallace family moved to Covington, Indiana. It was in Covington where Lew’s mother died from tuberculosis in 1834. In 1837 Lew’s father became Indiana’s 6th governor and the family moved to Indianapolis. Lew started his formal schooling in Covington in 1834. Although Lew showed a great aptitude and loved reading he much preferred the outdoors. This presented some disciplinary problems. Lew was finally sent away to a private academy in Centerville where one of his teachers encouraged his writing skills. In 1842 Wallace began working at the Marion County Clerk’s office. He was now an independent man living under his own roof and earning his own livelihood. In 1846 Lieutenant Wallace left to join Zachary Taylor in the Mexican War. Although, he saw little combat he gained experience that laid the foundation useful to him during the Civil War. After returning from Mexico, while attending a party at his Commanding Officer’s home, he met Susan Arnold Elston. Susan was born in 1830 to Isaac and Maria Elston. Isaac was a successful merchant and Susan was to benefit from the opportunities his wealth opened. She was an educated and refined young lady. 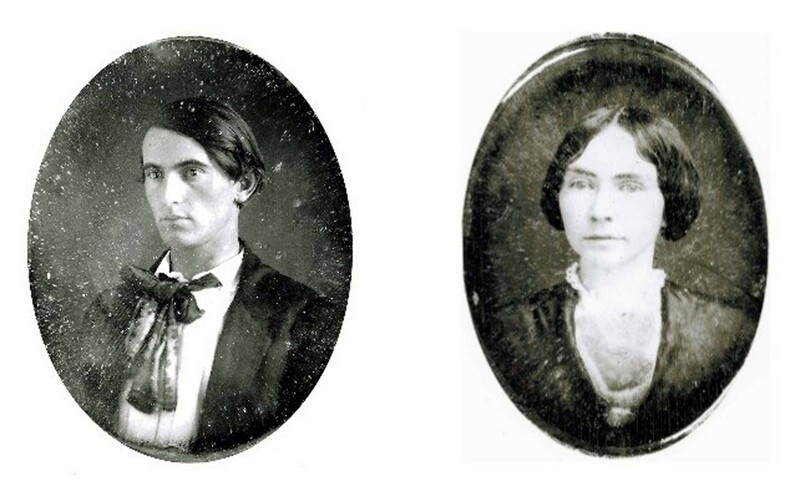 Susan’s parents had some reservations about the match, but never the less in 1852 the two were joined in matrimony in Crawfordsville. The following year Henry Lane Wallace was born to them. Henry was Susan and Lew’s only child. By this time you should be aware of Lew Wallace’s literary achievements, but I doubt many are aware of Susan’s accomplishments. She was a talented musician and author of many newspaper articles and novels—publishing years before Lew. Much of her works are of the religious and family nature perhaps reflecting her Quaker background. She also wrote extensively about their travels. Lew accredited Susan as being instrumental to his success—collaborating on many of their projects. Lew passed away while writing his autobiography—Susan finished it. Susan Wallace was a true partner in life with Lew. She passed away in 1907 and is buried next to him in Crawfordsville.